Thinking about getting involved in your community this semester? Then you might want to check out these community engagement scholarships! Deadlines are quickly approaching so be sure to submit your applications soon! 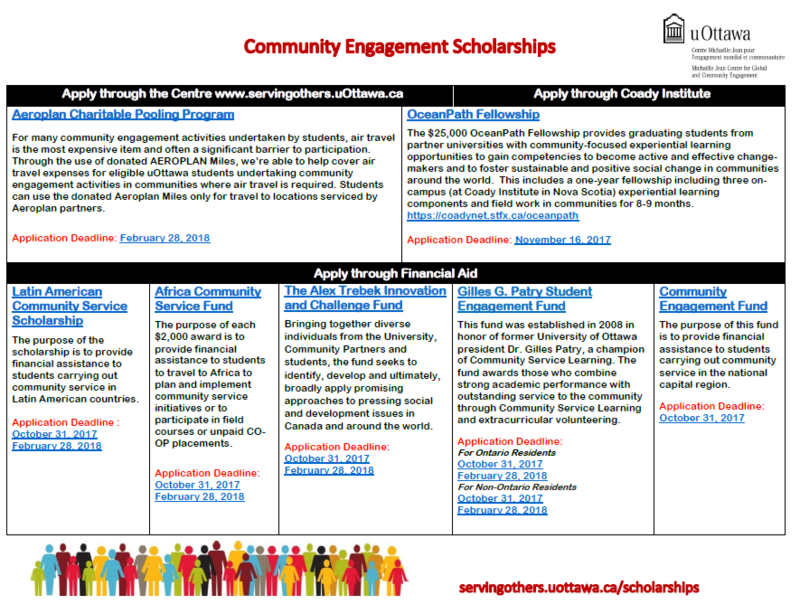 Click on the image below to access a PDF copy of the Upcoming Community Engagement Scholarships chart. Do you know a full-time student at the University of Ottawa who graduates in December 2017 or spring 2018 and has an idea on how to create positive social change in a community or has a social entrepreneurship project that she or he would like to get off the ground in Canada or overseas? 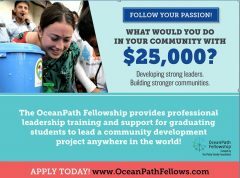 This student could have a chance to work on this project for 8 months and receive up to $25,000 to help turn ideas into action through the Ocean Path Fellowships! Training is also offered by Coady Institute for the 2018 cohort. Students can visit the website to learn more.